Photo sharing applications are clearly all the rage right now, with newcomers seemingly popping up every week. Between Instagram, picplz, Path and others, people already have a lot of ways to share their mobile snapshots with friends. 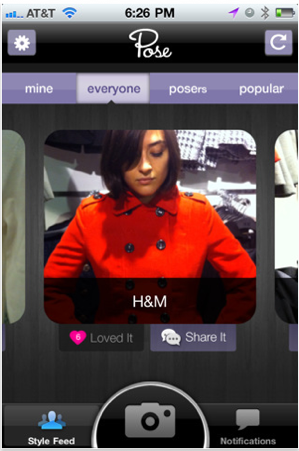 But now they’ve got one more, and it’s focused on a different use-case: shopping and fashion. Meet Pose, a new startup launching today in beta, that wants to help you share what you’re buying (or thinking of buying) with your friends. Today the company is announcing that it’s raised $1.6 million from True Ventures, GRP, and Founder Collective, with angel investors including Dave Morin and Shawn Fanning. Jon Callaghan (True Ventures) and Mark Suster (GRP) will be joining the board as part of the deal. You can grab the free iPhone app here. The premise is simple: when you’re in a store and you come across a neat jacket, or some nice jeans, Pose invites you to take a snapshot. Next, tag it with your current location and the item’s price, and share it with friends. Your friends can then leave their comments on the photo, and you can browse photos your friends have shared in the app’s style feed. In addition to the iPhone app, Pose has a web presence — every snapshot you take gets its own URL, which you can share via Twitter and Facebook. Right now the site is mostly focused on sharing things with your existing friends and followers, but the next logical step is for it to build out a community of fashion lovers on Pose itself. To help seed the community the site has created a list of fashion experts, designers, and stylists that it’s calling ‘Posers’ (yep, seriously), which give you content to browse even if you don’t yet know anyone on Pose.com yet. Pose is catering primarily to women and is playing up the fashion angle, but it’s leaving the experience open-ended, so you can submit photos of anything you’re thinking about buying. CEO Dustin Rosen wouldn’t get into specifics about how the service plans to generate revenue (the application is free), but he says that the service has some opportunities tied to the in-store shopping experience.